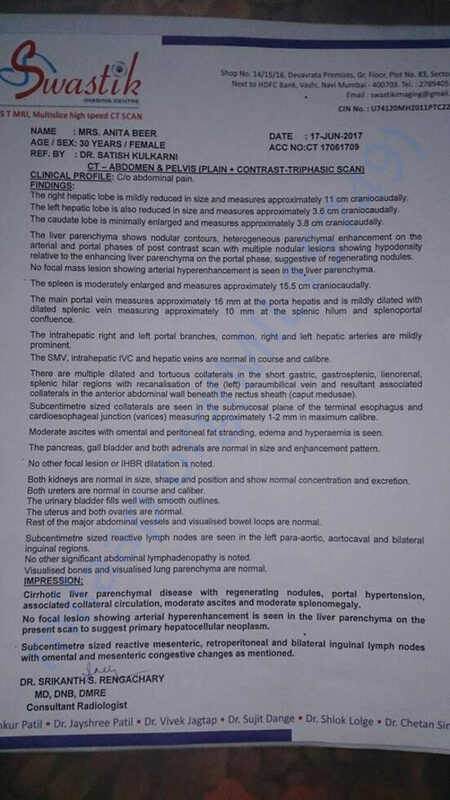 My daughter Anita Arun Kumar Beer aged 30 years is suffering from Liver cirrhosis since 10 years and is undergoing necessary treatment needed from Dr. Satish Kulkarni, sector17, Vashi, Navi Mumbai. 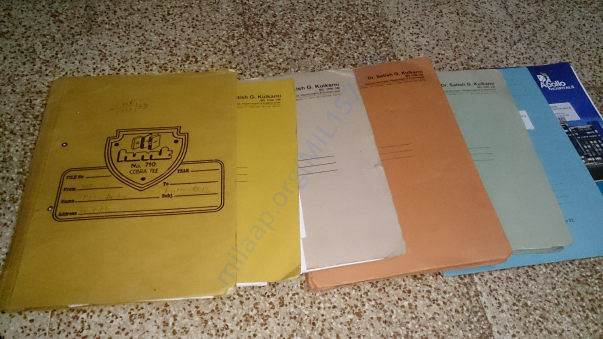 Given our financial situation, (Attach Income certificate of Tahasildar office Thane) we will not be able to arrange for this life saving surgery and treatment if we do not get financial help from your esteemed foundation. I place my trust and daughters well being in your capable hands and pray that you will show us the way. Anita suffered from Jaundice repeatedly (5-6 episodes) as a child from the age of around 10. She even vomited blood on one instance but because she was living in her hometown during this part of her life appropriate medical attention was not received. Doctors believe this may be one of the major reasons for her having contracted this illness. 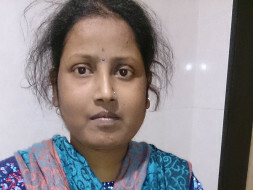 It was only when she came to live with her mother Shakuntala Revan Hally in Mumbai in the year 2007 that she was taken to the doctor and diagnosed with Liver Cirrhosis, and has since been under the treatment of Dr. Satish Kulkarni. She has been on a strict low salt diet and has been taking very strong medicines for all these years which has led to weakness in her bones, fluid accumulation in her abdomen and poor vision. She has had to undergo surgery in both her eyes in order to partially repair the damage and also had 5-7 litres fluid removed from her abdomen on 3 instances. Currently she is extremely weak, has an extremely low appetite, poor vision and swelling in her legs and abdomen. Anita’s mother is the sole bread winner of the family and has 3 other daughters besides Anita. She works as a house help to earn a living (Attach Income certificate of Tahasildar office Thane). She has been doing her utmost to take care of the cost of Anita’s medical treatment till now. This has also led to her being in heavy debts. Anita’s condition has now worsened and she is in urgent need of a liver transplant. The doctors plan to perform this surgery in the 1st week of July. We will be eternally grateful and thankful to you for helping us save my Daughter. 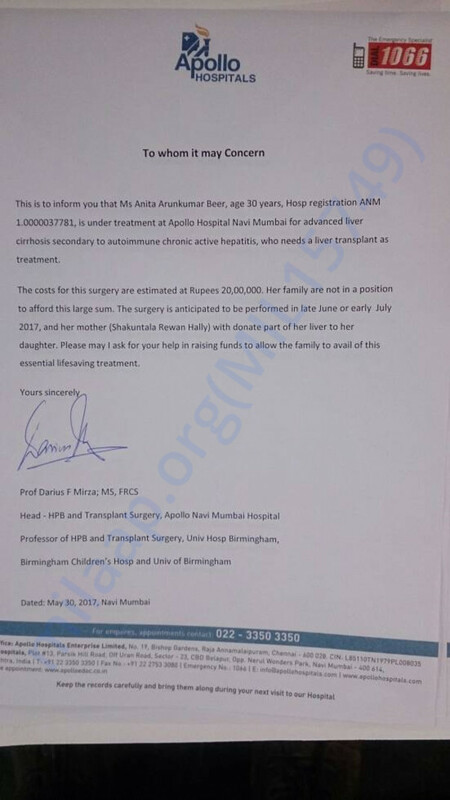 Dr Darius (Apollo Hospital) Letter for liver transplant. 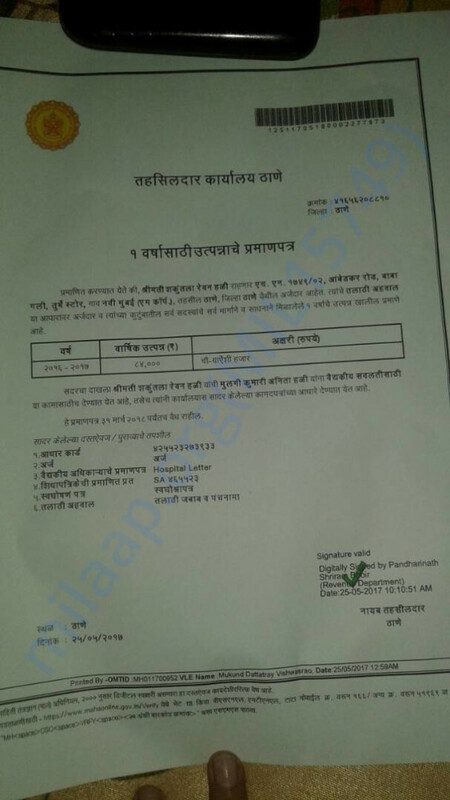 Income Certificate from Thane Tahasildar office.